Seaside rock is a mysterious English treat that has been made by hand for more than 100 years. If someone in England happened to mention that when they went to the beach in Brighton, they bought some rock to take home, chances are, unless you were British, you wouldn't have a clue what they were talking about. Was it an old-fashioned CD of the kind of music we all grew up with, perhaps? Maybe they took home an interesting pebble collected by the shore? Or was it heck of a big piece of bling to add flash to anyone's street style? It could be any of the above, of course. But it probably wasn't. Even if they called it a stick of rock you'd probably still be in the dark. 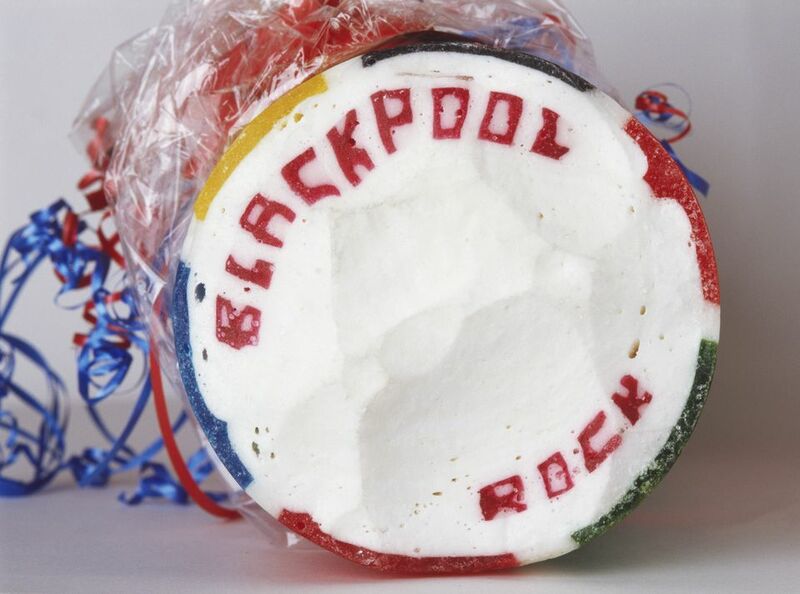 Rock is, in fact, a particularly British seaside souvenir sweet, as common along the arcades, boardwalks and piers of British beaches as boxes of saltwater taffy are on the tourist beach fronts of North America. Although it can come in a variety of shapes, the most common is a cylinder of hard candy, about 8-10 inches long and an inch in diameter - a "stick of rock." Some sticks of rock have a bright solid color, wrapped around a white or solid color center. Others are striped and the stripes often twist around the cylinder. But what makes rock a uniquely British treat is the way that words are embedded in the candy so that no matter where you break or cut the stick, at a right angle to its length, the words remain visible. The most common rock has the name of the place - Blackpool, Brighton, Margate and so forth - embedded inside it and running all the way through the length of the stick. Sometimes you might find slogans, declarations of love or the names of sports teams or politicians running for office. In the heyday of the Victorian seaside resort, saucy sayings, like "Kiss me Quick!" were more common than they are today. Nowadays a lot of rock is used for advertising, with promotional slogans running through the candy. Some rock is made with no special flavoring beyond the natural toffee flavor of cooked sugar. When it is flavored, the most common essences used are peppermint or aniseed. Recently, a tourist board distributed chilli flavored rock promoting a chilli farm on the Isle of Wight. Much to our surprise, it was actually rather nice and inspired this little essay. Despite all kinds of machines that are used to make candy and sweets, putting words inside a stick of rock is done by hand as it has been done since the candy was invented in the 1880s. An ex-Lancashire miner named Ben Bullock, a partner in a Yorkshire boiled sweets company Slade & Bullock, came up with the idea.. According to an ancestor of the Slade in that partnership, as reported in the Guardian, Bullock began experimenting with putting letters and shapes in the candy and his first commercial batch was a stick of rock with the words "Whoa Emma", apparently a popular song at the time. Most British people think that rock was invented in the Northwestern Victorian seaside resort of Blackpool, but actually, Bullock's first batches were sold in the markets of the West Yorkshire Ridings. Later, he sent several boxes to an acquaintance in Blackpool and his candy was a runaway success, quickly spreading to all the beach resorts in England. Creating the lettering inside sticks of rock remains a skilled job done by hand. While machines pull and fold the hot sugar candy, adding the air bubbles that turn it white, the letters are made by wrapping long, flat strips of colored candy around the white mixture. So, to make an "O" for example, the candy maker will roll out a thin rope of white candy, by hand, and wrap it in a thin strip of colored candy. Looking at the ends, the "O" is clearly visible, and every chunk cut from this rope of candy will have the "O" running through it. The letters aren't made and added when the candy is an inch in diameter stick. In fact, when the whole thing is assembled it's about a foot in diameter and about four feet long. It's then stretched and cut to produce the final size. A lot of American students who read Graham Greene's novel "Brighton Rock" in high school, or on an English Lit course, assume the name of the book refers to a place, perhaps a spot on the rocky coast of England somewhere. But the clue to the true title of the book is in a line spoken by Pinkie, the sociopathic murderer and anti-hero of the story. In describing himself as 100% Brighton, through and through, he says he is like the Rock, "with Brighton all the way through." Producers of the 1947 classic film thought the title, well understood by British audiences, would go over the heads of American film goers, so they released the film as "Young Scarface" in the USA. By the way, rock is unrelated to American rock candy.Rock candy is crystallized sugar precipitated out of a super saturated sugar solution onto a stick or a string. British rock is made by boiling sugar and pulling and folding it to incorporate air, changing the texture and color. And while most rock comes in sticks or cylinders, real old-school rock shops sell it in all kinds of shapes - from gigantic all-day suckers, to "full English breakfasts" of bacon, sausages and two fried eggs on a plate, the whole lot made of sugary rock!